Thank you for reminding me of a long-standing Logitech mouse problem that once forced a more than 12-minute start-up time on this computer, and which could still be my start-up problem, but there is no yellow mark next to anything in my Device Manager. In 2009, Logitech was unable to resolve the matter, and I ultimately deleted a device In Device Manager to speed start-up time somewhat, but I forget the details—and since forgot the matter. "My SetPoint Control Center software, version 2.42.257, using Driver version 2.42.257.00, won't let me select a different mouse. It's currently set to use your MX 600 mouse, but I want it changed to use your M-UR69 mouse. The SetPoint software, however, gives me NO option other than MX 600. 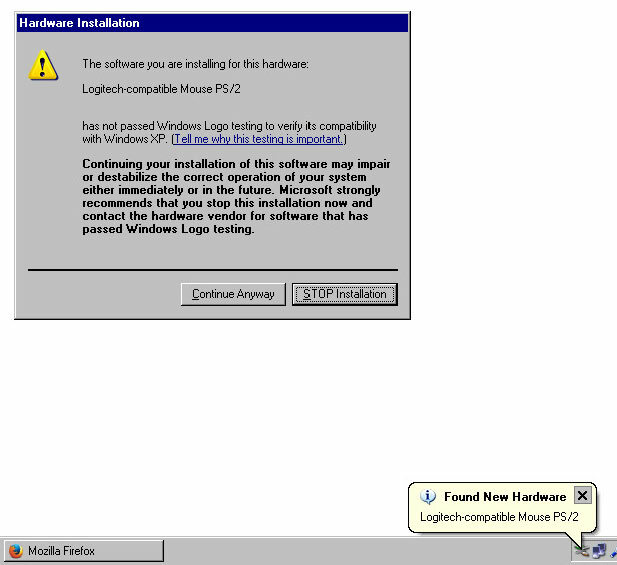 I tried to install a fresh download of what I think is the correct software to drive the M-UR69 mouse (mw9791enu.exe), but the installation program tells me I have a newer version on my system and won't complete the software install. How do we solve this?" This resulted in an online discussion thread wherein Logitech would have me uninstall, reinstall, again uninstall, try third-party uninstallers, buy RegCure for $39.95, run Windows Installer CleanUp Utility, do much of the same in Safe mode, use a generic mouse driver, execute System Restore, and more. Logitech could not tell me the names of related files to remove, nor could they guide me through the Registry. I ultimately told them the names of many files, but I still needed assistance. It was complicated. I have a PDF of 12 small-print pages documenting my discussion with Logitech. We talked on the phone, too. We did lots. Nothing worked. I had to tell them good-bye. I since switched to a wholly different mouse, albeit still Logitech (Model M215), and it is driven by a generic Windows driver. That said, should I skip the mouse issue for now and just proceed with the remainder of your last instruction, or is there some other way to address the long-standing mouse problem at this point? A pic of my Device Manager listing, expanded, is attached. Edited by JIm Andersen, 02 November 2013 - 12:11 AM. Go back in to Device Manager and click on View, Show Hidden Devices. Perhaps it will show up there. I see it loading in the boot log but it doesn't show up in Autoruns. Go ahead and do the other stuff. Thanks for the "Show Hidden" advice! 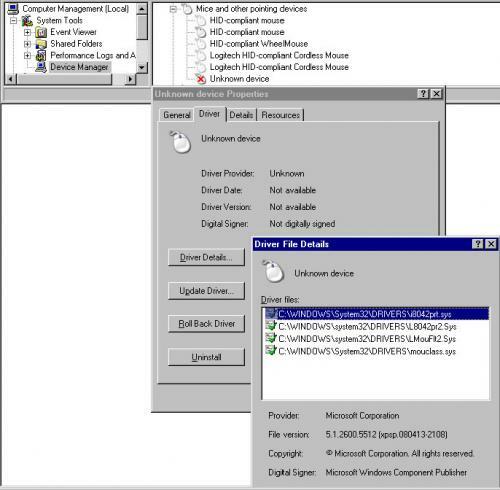 Had no idea of that in Device Manager. Which of these, if any, should I verify are disabled? Edited by JIm Andersen, 02 November 2013 - 09:11 AM. Looks like you just have the one. net.tcp port sharing service. I have 4 on mine. The Process Explorer Log is below. 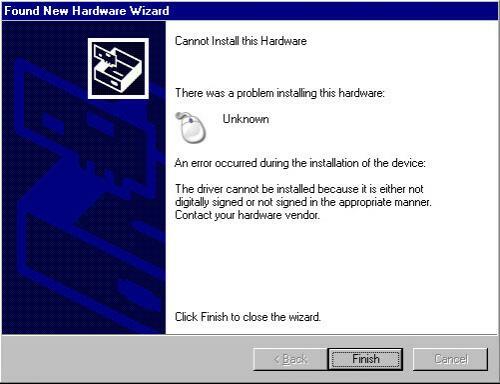 Machine Debug Manager, presuming that was the problem "MDM", was already disabled. 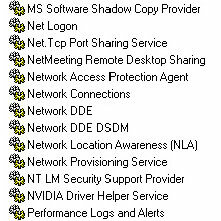 I disabled Net.Tcp Port Sharing, and there were no other Net-dot items to disable. Finally, the Autoruns log was zipped and is attached to this reply, and start-up time is about the same as last reported. CarboniteService.exe	9,156 K	33,064 K	1320	Carbonite Secure Backup Engine	Carbonite, Inc.
avgrsx.exe	20,144 K	25,764 K	480	AVG Resident Shield Service	AVG Technologies CZ, s.r.o. avgidsagent.exe	29,272 K	30,700 K	360	AVG Identity Protection Service	AVG Technologies CZ, s.r.o. ArcNameService.exe	752 K	2,236 K	2568	ArcNameService Application	Smith Micro Software, Inc.
See if you can right click on the unknown device and Disable it. Are you using Carbonite? (This is a cloud based backup service that you have to pay for) If not, uninstall it. Uncheck the Chrome browser and the Google Toolbar foistware before downloading/installing. Save the file but don't install yet. Wow, I had no idea AVG was such a hog! Thank you! Spybot S&D is now uninstalled. Avast! Online Security 9.0.2006.53 wants to install as an add-on to my Firefox. Should I allow that? Any idea on that pesky "unknown" mouse—or anything else, by chance? Yes. It will just warn you if a website is suspicious. When you do a google search you will see green, red and orange marks to the right of each entry. 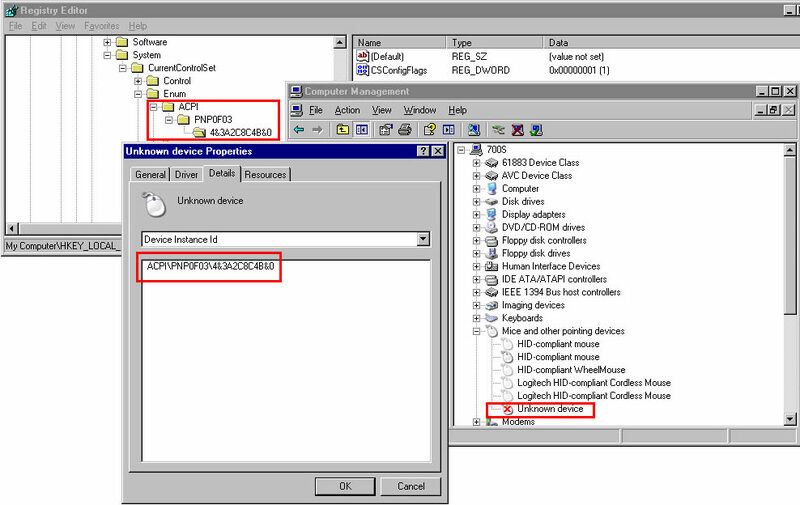 You may have hit on something there, as shown in this match of the Device Instance ID to that very location of the Registry, but I wouldn't know how to address it. What might I do? Sorry for the delay. Not sure what happened. You are the second person today that has gotten lost. I think you can right click on the registry entry for PN0F03 select Export then save it somewhere you can find it again, doesn't matter what you call it say pn0f03 and it will save it as pn0f03.reg. Then right click on pn0f03 and Delete. Then reboot and see if it comes back. I wouldnot think it would hurt anything to do it that way. Then if it makes things worse you can always right click on pn0f03.reg and Merge to put it back. Hi, Mr. Kinner. Thank you for returning. I'm glad your departure was just a system fluke. I am sorry, but the hope I raised in my last Reply was found in a different Registry location than the one you had noted. The matching data was found not in HKEY_LOCAL_MACHINE\SYSTEM\CurrentControlSet\Enum\Root, but rather in *\Hardware Profiles (not Root). Nonetheless, I did the export/reboot process you suggested, but the problem remained. There was no change in start-up, so I merged the exported Key back in. An accurate search, this time, for 4&3a2c8c4b&0, found nothing in the designated Registry branch, but several elsewhere; too many to list. A few, though, did encourage me with what looked to be Logitech Mouse references in either the Key Names or associated values, like the "LMouFlt2" or the "Mouclass" you see in the second and third Key Names shown below. The problem is, I don't know what to do with this information. Do you think it would be safe to conduct the same export/reboot process for each or any of these findings, and are there certain Keys I should not touch? Edited by JIm Andersen, 11 November 2013 - 09:50 PM. I also deleted 413 fonts once used in business, but that did necessarily speed things up. 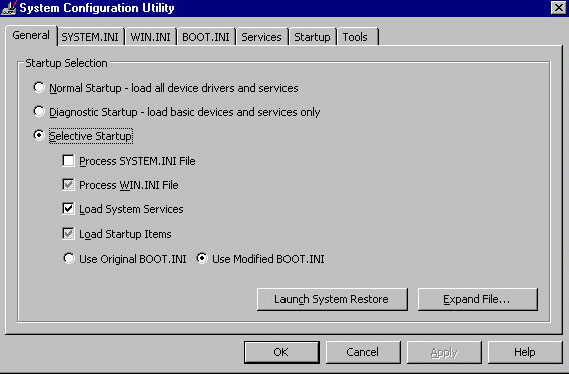 In System Configuration Utility, I removed just a few start-up items for applications I am familiar with. In the end, the start-up time is slightly improved from what was last 1:46+2:33. It is now 1:39+2:25. At one point, with my mouse not loaded and me working only with the keyboard, and then as a new window suddenly blocked my view, I inadvertently changed a setting on the screen below but I do not know which setting. Do the settings look right here, or not? On its BOOT.INI tab, you once had me select the /BOOTLOG Boot option. Am I to keep that option, or was that for diagnostic purposes only? The /BOOTLOG option is still selected. We have made some improvements and I appreciate your help to get where we are. Thank you. With that, is this the end of the road—or do you have other steps in mind? Edited by JIm Andersen, 13 November 2013 - 02:25 PM. If the mouse still works then it's probably OK.
No need for the boot log any more so I think you can just tell msconfig to do a Normal Startup. It's best to uninstall anything you don't need rather than stop it with msconfig. There is one other troubleshooting technique but it takes a long time and the logs are so big that they can't be sent via the forum. Perhaps you can look at the logs and see if you see where it is taking a lot of time or getting errors and then just do a screen shot of that part of the log? Run Process Monitor then under Options, click Enable Boot Logging. Close Process Monitor and reboot. There are several segments with sections that appear to repeat over and over; sections mixed with "Success" and "Name Not Found". One section of perhaps 20 lines or so, for instance, repeated itself 128 times or more, but still ended after less than two seconds. There were several such segments like that, so I wouldn't know which segment to hone in on. There were a few longer strings of SUCCESS, but they were rare and really not so long. So, it may be DAYS until I make some sense of this, if I am to, but I wanted you to know I'm on the case.